Founded by the artist S Sadia and the composer & sound designer Stephen W Tayler, equa is an ongoing multi-media world fusion project. 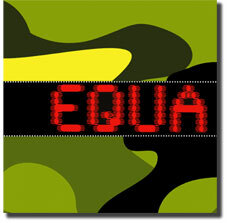 First signed to Polygram (Australia) in 1996, and based on an original idea by S Sadia, equa’s brief was to find links based on the commonality of human experience. The album features music gathered from the ‘Tropical Belt’, which was compiled and cross-referenced by theme, region, instrument, key and tempo. This allowed the artists to search for the thematic and musical links in performances and samples, and translate these into a new context. The resulting album begins with a ‘Departure’ (of which an extended remix by ‘Tricky’ also featured on the original single) and closes with an ‘Arrival’, and the intervening tracks seek to mirror not only a physical but a spiritual journey. The album is also intended to reflect the circadian rhythm of each day, as it begins with dawn sounds and closes with a ‘Lullaby’ presaging the coming of the night. The subtext underscoring this is not only the rhythm of each day, but the cycle within each human life. The eponymously-titled album 'Equa' was nominated for an ARIA award. In 2004, Equa completed the soundtrack for the critically acclaimed film 'The Noon Gun’, which received its world premiere at the Melbourne International Film Festival (MIFF), and has since been screened at film festivals around the world, including at the Tricycle Theatre, London in 2009 as part of the programme 'The Great Game: Aspects of Afghanistan'. The soundtrack album is available through Chimera Arts on iTunes.